So Gary, do you still remember how and when was Jaguar formed and how did you hook up with each other? 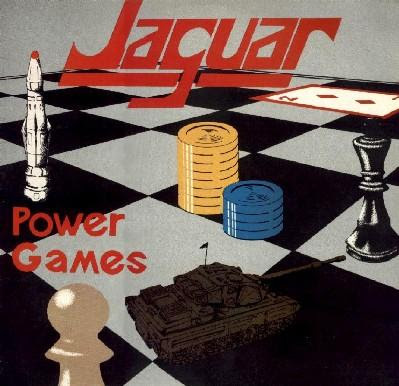 Was Jaguar the very first band for all of you or did you have earlier some musical experiences? Jeff Cox and I formed the band late in 1979. We met at college and had been playing together for a while with other people, getting nowhere, so eventually we decided to get our own band together. We placed an advert for a drummer in our local newspaper, and from the advert Chris Lovell joined the band, he was only 16 years old at the time and was driven around by his mum!! It was his first band as I recall. Robert Reiss joined some months later. Who came up with that metallic sounding name? As usual we spent ages trying come up with a good name, as bands do, but couldn’t think of anything. One of us came up with Jaguar, we weren’t all that keen on it but went with it anyway as we couldn’t come up with anything better. We actually changed it but had to change it back because we entered a ‘battle of the bands’ competition as Jaguar and had to perform in the semi-finals. The New Wave of British Heavy Metal was a spontaneous movement that ocurred between 1979 and 1983/4 in Britain, how did you feel seeing popping up bands, such as Sweet Savage, Blitzkrieg, Diamond Head, Girlschool, Grim Reaper etc. everywhere from England? Well yes it was a movement I guess, it was very healthy with a ‘do it yourself’ mentality regarding both records and gigs. Did you try to build up a friendship with the late '70s NWOBHM bands? We never really knew any back then, there weren’t any from our part of England, the South West, we later became friendly though with Raven. Yes I guess they were all individual, some of us played fast, others more traditional sounding. This was of course before there was any speed, thrash or death metal! Was a competition among the bands? Not that I was aware of. I suppose there’s always some kind of competion among bands though. More than 300 bands tried to make their names in that prolific scene, from whom only three ( Iron Maiden, Def Leppard and Saxon ) survived until our days, how do you view it? I wouldn’t say only those three survived, there are loads of smaller bands who never split up and are still going today. There are an awful lot more who split up years ago but have since re-formed, like us. The three you mentioned are of course very good, had major record deals and achieved success, I’m sure this is why they survived. Would you say, that it was hard to make a name for Jaguar back in the day, since a lot of bands started their carrer in the same time as you? It’s always hard to make a name for yourself, we didn’t have the internet or e-mail back then. Having said that I think it’s just as hard nowadays, major record companies are no longer interested in rock bands, it’s gone back to the ‘do it yourself’ type of thing again. Do you agree with, that New Wave of British Heavy Metal's music reacted against the artifice of contemporary pop, placing an emphasis on musicianship and amplification, the former trait setting it apart from punk rock? Yes I guess so, I think it took traditional musicianship and married it with the energy of punk, in the early days of NWOBHM anyway. That’s how I saw it back in the early eighties when we first started out. Before the NWOBHM movement was Punk on its peak, but in two years it vanished of sight, correct? It may have vanished out of mainstream sight but it was still there bubbling away. In the early eighties a new breed of punk emerged in England with bands like GBH and The Anti-Nowhere League, it was still strong, and still is. The NWOBHM thrived on volume, speed, and directness, with an idealised working class image, what's your opinion about it? Hmm, I’m not sure about the ‘working class’ type of thing, we were what we were, but volume and speed yes definitely, in our case anyway, we loved to play as fast as possible, ha ha!! NWOBHM as musically characterised by power chords, fast guitar solos and melodic, soaring vocals, with lyrical themes often drawing inspiration from mythology, fantasy fiction, and the occult, what's your opinion about it? Agreed, not all NWOBHM bands are fast and ‘punkish’ there’s a whole bunch that are kind of doomy and Sabbath like, they tend to use the fantasy type of lyrics and themes. That’s OK though, there’s room for everybody. Do you think, that Venom was the most extreme band at this point? Did they fit to the scene both musicwise and lyricswise? Yes they were the most extreme band at that time. I suppose looking back they didn’t really fit the NWOBHM mould both visually and musically. I thought they were pretty original back then and of course they started the whole black metal thing. Was the scene oversaturated or…? I never thought of it that way. It just seemed like a healthy scene with bands popping up all over the place, I don’t think it was big enough to be oversaturated, unlike the way punk became for example. Back to Jaguar, can you tell us about your rehearsals, about the first steps of Jaguar? We were lucky that Chris Lovell had really understanding parents and they let us rehearse in the cellar of their house, four times a week for free, which of course was a massive help in getting the band started. We decided to concentrate on writing songs and coming up with song ideas for the first few months before even thinking about getting a singer in. We did that for three or four months or so until we had enough material to put some proper songs together ready for a singer to come in. Did you start writing originals right from the start or were you jamming on covers? We started writing our own songs straight away, which was always our intention, but as I recall we played two covers at our very early gigs, AC/DC ‘Sin City’ and Van Halen ‘You really got me’. Apart from those two the only other cover Jaguar played was The Move’s ‘California Man’. Probably around January 1980. We knew of Rob as we’d seen him around in various clubs in Bristol that we used go to. We heard he could sing a bit so we asked him to come along to a rehearsal. It went very well and he ended up joining the band. I remember there being great excitement that we had a full line up at last! On March 22nd 1980 you recorded your first demo including „Feel the heat", „Battle cry" and „Piledriver", do you still remember how was it recorded? Was it your very first recordings experience? Yes it was the first time in the studio for all of us, and was recorded very quickly. We simply set up the equipment played the songs through and that was it, all done and dusted in a couple of hours! Now of course we argue and fiddle about with drum or guitar sounds for hours on end, ha ha!! It was recorded for a Battle of the Bands held by Melody Maker magazine and Jaguar ended up placed fourth in a field of 700, would you say, that it was your first success? What did it mean for you at all? Yes I guess it was our first success. We sent the tape off to Melody Maker and forgot all about it, then a couple of months later out of the blue we received a letter to say we got through to the South West regional final. We weren’t really expecting it so we had to get ourselves ready for the final pretty quickly, we were very excited about doing it. Would you say, that the fans liked a lot the demo and it was an excellent start for you? People seemed to like it but the aim of it was really just to get gigs, and get the name in circulation with radio and club DJ’s. It served it’s purpose as it was difficult to get gigs without having a demo. This placing put you in the South-West regional final, which marked your debut gig on May 2 1980, what do you recall of that particular one? It was my first ‘proper’ gig and I was absolutely terrified, I remember thinking if I was going to be this nervous before every gig then I couldn’t do it. After the first couple of songs though the nerves disappeared and then it felt fantastic, after the gig we were buzzing! What about your setlist and how did the crowd welcome the band? We weren’t allowed to play for very long as I recall, we went down OK but it was a very mixed crowd, made up of the different bands’ supporters, none of whom were into metal as we were the only rock band playing. But it was all about impressing the judges, one of which said he thought we wanted to be the next Def Leppard, ha ha!! Regular gigs in the Bristol/South-West areas followed, were you mainly headliner acts or rather opening ones for bigger names? Did these shows help the band getting new fans? A mixture of our own gigs and supporting other bands. We were friends with the manager of The Granary Club in Bristol and he let us play there regularly, supporting and headlining which was a great help to us. We played all over the South West though, pubs and clubs, and some of the gigs were wild, venues like The Cellar Bar in Taunton were rocking. A second demo was recorded on December 22 1980 featuring „Stormchild", „War machine", „Ain't no fantasy" and a new version of „Battle cry", can you give us details regarding on this tape? We wanted a better quality demo and we wanted to record some newer songs we’d written, as it was nine months since we recorded the last one we decided to go into the studio again. Did it sound closer to what you wanted to achieve with Jaguar? It was a step forward I guess but still recorded very quickly with minimal production. I think we’re still trying to achieve the ‘perfect’ Jaguar sound! All of these tracks plus „Feel the heat" and „Piledriver" were put together to form the Jaguar demo, which was advertised in Sounds and Kerrang, can you tell us more about it? As we didn’t have any vinyl out at this point we decided to put the demo up for sale at gigs so people could have some music to take home if they wanted. That was how it started out but it kind of grew from the ads we put in Sounds and Kerrang. We were getting orders for the tape from Holland and Germany as well as England, which took us by total surprise. Then one day out of the blue two people knocked on Chris Lovell’s front door saying they were fans from Holland, they ended up staying a week and became our friends and organisers of our first gig in Holland! That tape really kick started things in Europe for us and allowed us to go over and play many times, something that we still do today. Was the goal of this tape to attract some label interests and making a bigger name for the band? Well yes, the intention was to improve the bands’ position. Better quality demo, new songs recorded, we were trying to take a step forward. Is it correct, that this tape also got a lot of orders from Germany and in particular Holland and got the ball rolling for Jaguar in Europe? Yes it did much to our surprise. As I’ve already mentioned we got off to a flying start in Europe allowing us to go over there and play some great gigs. We were pretty young at the time, Jeff Cox was the old man of the band at 21! Better, but still only a couple of hours in the studio to record. In 1981 you appeared on the Heavy Metal Heroes compilation (Heavy Metal Records, 1981), with „Stormchild", how did it happen exactly? We were contacted by Paul Birch, who ran the label, and asked if we would be interested in putting a track on it. As we had no other vinyl coming out at the time we decided to do it and put ‘Stormchild’ on it. Is it true, that your contribution was a newly recorded version of „Stormchild", recorded in one four-hour session on 8-track equipment? Didn't you think about to record a brandnew, exclusive track for this compilation? It was an exclusive track for the album. Paul Birch arranged the recording session and to our disappointment we drove up to Birmingham one Saturday morning to find the ‘recording studio’ was in fact someone’s garage!! There wasn’t much we could do except do our best and go ahead with the recording in the couple of hours that were available to us. I think it turned out OK given the circumstances. Which bands were still featured on it besides you? I haven’t got the album cover to hand but I remember bands like Split Beaver, (great name! ), were on there. Yes I guess, just for a single though, we weren’t keen on committing to an album with the label at this stage. Weren't other labels interested in the band? To be honest at this point we weren’t really looking for a label, it was something we hadn’t yet started to do. Heavy Metal Records came to us so we didn’t have to look around. Thinking about it now though I don’t know why we weren’t looking for a deal. The second week of November 1981 Jaguar released their debut single called „Back street woman/Chasing the dragon", was it the first fruit of the collaboration with Heavy Metal Records? Yes after the HM Heroes compilation. How do you recall the recording sessions of the single? We decided to use Spaceward Studios in Cambridge, because Iron Maiden had recorded ‘The Soundhouse Tapes’ there, no other reason ha ha! Paul Birch booked us an eight hour session, although laughable we had to complete it in this time span. We drove up from Bristol in time to start the session mid afternoon, quickly set up the equipment and started blasting it out. As usual I remember it being an almighty rush to get it done in time but we managed it. We had a gig the next day in I think Nottingham so the studio owner kindly let us sleep on the floor as we couldn’t afford a hotel! I remember the next day on the drive to the gig one of the wheels of the van fell off and the van nearly rolled over!! Is this single ranked among die hard headbangers as a classic for metal generations to come? I don’t know about that, you’d have to ask the people that bought them. This release also meant your first gig in Holland in late November 1981, so it was your first experience abroad, wasn't it? How did it go as a whole? It went very well and was a real eye opener for us. Myself and Chris Lovell went over a week before the gig for a bit of a holiday. We stayed with the promoter/fan of the gig whose family were brilliant, they made us feel very welcome. We had a look around Holland for the week then travelled by train down to Amersfoort to meet up with the rest of the band for the show. I remember walking through the train and hearing the demo tape blasting out on peoples’ cassette players!! What kind of crowd did you have in Holland compared to England? We were taken by surprise really. At this point we were used to playing to smaller audiences in England, in pubs and clubs. This gig was the biggest we’d done, to a very enthusiastic crowd, which was fantastic, it was better than we could have hoped for. A couple of years ago someone sent me a CD of the gig, which I didn’t know even existed, it was interesting to hear it again. Did it success for you to substantiate Jaguar's name in Europe? I think it certainly started the ball rolling for us in Europe, people seemed to enjoy the show. Ten weeks after the single's release the original 4.000 copies were sold out and there weren't any more pressed, have you ever counted on a such great result? We didn’t really think about it at the time until the record company turned round and said they were all sold, obviously we were pretty pleased about it. It was a very successful single, isn't it? In a small way yes. Although you seemed to be successful, you have sacked your singer Bob Reiss, what went wrong with him? Now there’s a story. When Rob joined the band he was a really nice guy, funny, good company, hard working, but that all changed when he started going out with a particular girl. He became moody, rude, and difficult to deal with, obviously we couldn’t put up with that so he had to go. Looking back I’ve no idea why he changed in that way, there was no reason for it. It was a real shame as he was a great frontman. He was replaced by Paul Merrell, how did he get in the picture exactly and was he the first choice of the band? What about his musical past? We knew Paul as he was the on and off singer in ‘Stormtrooper’ who were a band based in Bristol. We used to bump into each other around the area so we knew what he could do and decided to ask him if he would be interested in joining Jaguar. We had a blast in the rehearsal room, it sounded great, so he joined. He released one single with Stormtrooper which has become a bit of a collectors item. Paul actually joined us just after leaving a band called ‘Hellrazer’ who he was living in London with. How did you view Paul's range of vocals to Bob's one? Did you want to find a copy of Bob or rather a singer with a unique, original range of vocals? Paul and Rob’s vocal styles were completely different, Rob had a more traditional metal style whereas Paul’s was more blues based. It was just co-incidence that it turned out that way but both styles fitted the band and there were no complaints. If I'm correct Paul's first performance with Jaguar, was at London's famous Marquee Club in March of 1982 an opening show for The Rods, how did the show succeed? Were you happy with Pauls achievement? Paul’s first show was actually in Uden in Holland five days after he joined the band in January 1982. We were worried how it was going to go as Paul didn’t really have enough time to rehearse properly for the show but we pulled it off, Paul was still reading lyrics as we walked onstage, ha ha!! The British do not support Jaguar nearly as much as Europe did, especially Holland, where you've achieved your best level of success, what was the reason of it? Was Holland a kind of second home for you? Yes it was our second home, and I still consider Holland that way. There’s just something about the country that I love. We’ve played in Germany regularly in recent years and that’s a great place to play too. Not only you, but other bands, such as Satan, Mercyful Fate etc. were successful in Holland back in the day, correct? Yes we did, in Hilversum. This was the interview when Chris Lovell shouted ‘we’re gonna rock your clogs off’ on air and after that people kept shouting it at us all the time, it became a kind of catchphrase I guess. People even began waving clogs around at our gigs!! Five days after Paul Merrel joined the band Dave Wood managing director of Neat Records, saw your gig at a Dutch Heavy Metal Festival and was so impressed that he offered the band a one-year recording contract, do you still remember this special moment? Were you happy about it? We were happy about it because it was what we wanted. We saw Neat as the number one NWOBHM label and wanted to be on it, so to have Dave Wood sitting there asking us to join the label was a great feeling. As for Neat Records, which bands did they have besides Venom? Were they the leading label considering the NWOBHM movement or…? As I’ve just said we considered them to be number one as at that time they had Venom, Raven, The Tygers of Pan Tang and White Spirit among others. Of course a lot of those bands swiftly moved on to other labels. Most of the bands of this era (early '80s) were signed to Neat Records, who has released volumes of NWOBHM compilations in later years, how do you explain this? I don’t know, perhaps it’s the label trying to make money, or maybe they were supplying demand for NWOBHM material, this has continued with Sanctuary Records since they bought Neat. I will say though that Sanctuary’s NWOBHM stuff is pretty good, very thorough. In one scheduled studio session Jaguar recorded three songs, what were the titles of these tunes and what have we to know about the recording sessions? The session took place in April 1982 at Impulse Studios in Newcastle and we recorded three songs, ‘Axe Crazy’, ‘War Machine’ and ‘Dirty Tricks’. The session was intended to be for our first single for Neat plus a song for the ‘60 min plus’ compilation album. The songs were recorded pretty fast as usual, from memory I think we only had one day to do it in so we did what we could within the time frame. I think we chose the right songs to use, they were both live favourites, and the single ended up doing OK for us. Both songs are still popular now and we couldn’t do a show without playing them! You appeared on the „60 Min. Plus" (Neat Records, 1982), with „Dirty Tricks", can you tell us more about this? The compilation was a collaboration between Neat Records and an English music paper called Sounds. It was a cassette tape which was only available via mail order through the paper. We weren’t really involved in it too much but it helped us by getting the band’s name in a national music paper for a time.